Fourteenth in a series of annual reports comparing business regulation in 190 economies, Doing Business 2017 measures aspects of regulation affecting 10 areas of everyday business activity: -Starting a business -Dealing with construction permits -Getting electricity -Registering property -Getting credit -Protecting minority investors -Paying taxes -Trading across borders -Enforcing contracts -Resolving insolvency These areas are included in the distance to frontier score and ease of doing business ranking. Doing Business also measures features of labor market regulation, which is not included in these two measures. This year's report introduces major improvements by expanding the paying taxes indicators to cover postfiling processes--tax audits, tax refunds and tax appeals--and presents analysis of pilot data on selling to the government which measures public procurement regulations. Also for the first time this year Doing Business collects data on Somalia, bringing the total number of economies covered to 190. Using the data originally developed by Women, Business and the Law, this year for the first time Doing Business adds a gender component to three indicators--starting a business, registering property, and enforcing contracts--and finds that those economies which limit women's access in these areas have fewer women working in the private sector both as employers and employees. The report updates all indicators as of June 1, 2016, ranks economies on their overall 'ease of doing business', and analyzes reforms to business regulation - identifying which economies are strengthening their business environment the most. Doing Business illustrates how reforms in business regulations are being used to analyze economic outcomes for domestic entrepreneurs and for the wider economy. It is a flagship product produced in partnership by the World Bank Group that garners worldwide attention on regulatory barriers to entrepreneurship. 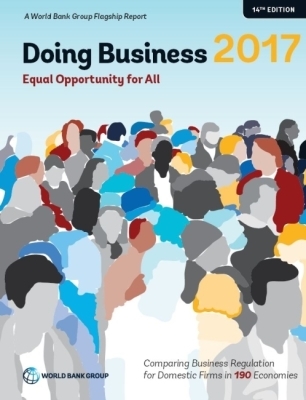 More than 137 economies have used the Doing Business indicators to shape reform agendas and monitor improvements on the ground. In addition, the Doing Business data has generated over 2,182 articles in peer-reviewed academic journals since its inception. Chief Economist at Kuwait China Investment Company. Previously, he was a Senior Economist at the World Bank, a Research Associate at Harvard University, and an economist at the Inter-American Development Bank. His main interests include macroeconomics, fiscal policy, public finance, investment, welfare theory, and development. He has published articles and books. In 2003, he published "What do you mean?," a book on efficiency and equity in social services delivery, by IADB/The Johns Hopkins University Press. In 2007, he co-authored The World Bank, a book in Italian by Il Mulino. In 2008, he co-authored Reshaping Economic Geography in East Asia, a book by The World Bank.